This section explains briefly about how to create a ReportViewer in your web application with Angular. 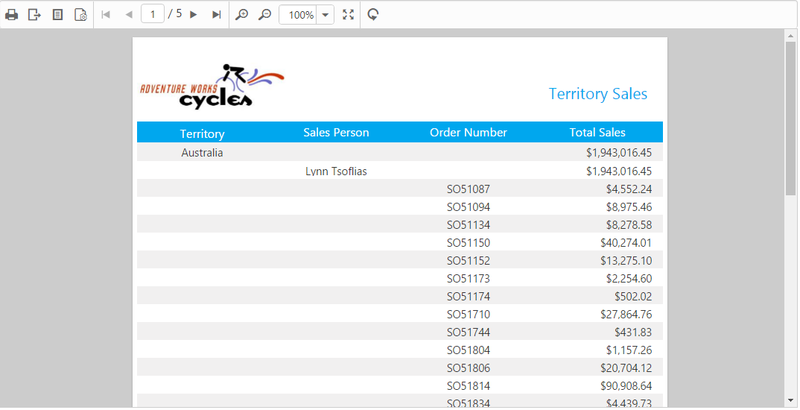 In this tutorial, you can learn how to create a simple ReportViewer control, Load RDLC Report and Load SSRS Report in your web application with Angular. Create a HTML page and add the scripts and CSS references in the order mentioned in the following code example. In the above code, the ej.web.all.min.js script reference has been added for demonstration purpose. It is not recommended to use during deployment as it contains all the widgets, which result in deploying large script file. Instead, you can use the [CSG](https://csg.syncfusion.com/# “”) utility to generate a custom script file with required widgets for deployment purpose. Add necessary HTML elements and CSS style to render the ReportViewer and set the desired reportPath and reportServiceUrl properties to the ReportViewer. reportServiceUrl Specifies the report Web API service URL. reportPath Gets or sets the path of a report file. The following code snippet defines the ReportViewer control in Angular. The ReportViewer uses online Web API services to process the report file, process the request from the control, and return the processed data from the control to client side. You can load the RDL/RDLC report with the help of local web service for .NET Platform and .NET core Platform. Describes how to configure the local Web API service URL for .NET platform in Angular ReportViewer. Describes how to configure the local Web API service URL for .NET Core platform in Angular ReportViewer. Default RDL Report will be rendered, which is used in the online service. You can obtain the sample RDL/RDLC files from Syncfusion installed location (%userprofile%\AppData\Local\Syncfusion\EssentialStudio\17.1.0.38\Common\Data\ejReportTemplate). Execute the below command in the command prompt. The application gets opened in the browser automatically and now, navigate to the ReportViewer tab to view the ReportViewer output on the page as displayed in the following screenshot. The credential information for Report Server is provided in online service. The ReportViewer has data binding support to visualize the RDLC reports and Set the desired reportPath, reportServerUrl, processingMode and reportServiceUrl to ReportViewer. The following code example helps you to bind data to ReportViewer. reportServerUrl Specifies the URL for the Report Server. processingMode Specifies the processing mode of the report. reportPath Gets or sets the path of the report file. The ReportViewer has a data binding support from server side to visualize the RDLC reports. You can pass the data source from the WebAPI controller.